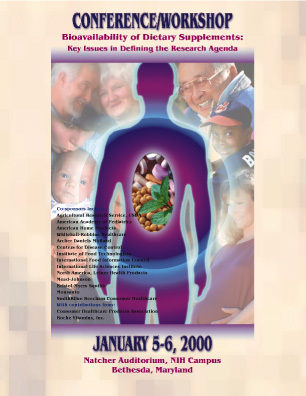 In Fiscal Year 1999, Congress mandated the ODS to study the issue of dietary supplement bioavailability. To address this mandate the ODS initiated a partnership with the Life Sciences Research Office (LSRO) for a conference/ workshop to explore the current state of our knowledge about the important issues related to bioavailability of nutrients and other bioactive components from dietary supplements. The Bioavailability Conference/ Workshop is chaired by Dr. Mary Frances Picciano, Professor Nutritional Science, Penn State University (currently serving as Visiting Nutrition Scientist with the ODS) and is co-chaired by Dr. Daniel J. Raiten, Ph.D., Senior Staff Scientist, LSRO. The conference/ workshop will be held on January 5-6, 2000 at the Natcher Auditorium on the NIH campus in Bethesda, MD. 3. to produce a published document consisting of the proceedings of the plenary session presentations, the summary statements of workshop break-out groups convened to address specific questions about research needs, and conclusions of the assembled conference/workshop participants with regard to steps needed to advance the research agenda. These goals will be accomplished through discussions of general issues concerning bioavailability and the application of general scientific principles for the study of bioavailability to case-studies of several well-characterized substances. The case study substances selected are folic acid, iron, and a botanical product (isoflavones). These substances have been selected because of their accepted importance in public health, and the availability of data.